This entry was posted in Uncategorized on October 27, 2014 by Jodi Mackay. It's looking to be another tasty week in The COR Coffee Shop and Deli! This entry was posted in Uncategorized on October 20, 2014 by Jodi Mackay. I'm a little late getting this posted this week! Wednesday (15th) - Broccoli and Cheese Thursday (16th) - Hungarian Beef Friday (17th) - Chicken Noodle Salad of the week - Chicken Caesar Sandwich of the week - Turkey and Veggie with herbed cream cheese spread Please stop by and grab some tasty grub! This entry was posted in Uncategorized on October 14, 2014 by Jodi Mackay. 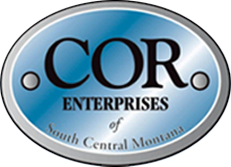 Earl Husby said "good bye" to COR Enterprises at the end of September. He started at COR in early 2003. During his time at COR, he was a valuable team member in several different departments. He is quick with a smile and a helping hand. While he admits it's hard to leave those he's become so close with over the years, he's excited to retire. At his retirement potluck, he playfully asked that no one "bother me for at least two weeks!" However, it sounds like his wife has a very thick book of "Honey-Do's" that she has been patiently waiting for him to complete! Earl says he has a few items on his bucket list he is eager to cross off. We wish you the best of luck and fun in your retirement, Earl. Take care and keep in touch! Earl says "so long" at his retirement potluck. This entry was posted in Uncategorized on October 8, 2014 by Jodi Mackay. 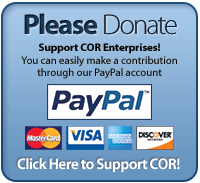 COR Enterprises is one of the lucky recipients of Lucky's Market Bags for Change program. During the months of October, November and December, take your reusable bags to Lucky's. For every reusable bag you use, you'll receive a wooden dime to drop in COR's donation box. At the end of the quarter, Lucky's will double the community's donation! In addition to providing nutritious and tasty choices to Billings, Lucky's has proven to be a great support in our community. We're so glad you're here, Lucky's! This entry was posted in Uncategorized on October 7, 2014 by Jodi Mackay.